As the all-in-one and full-featured PlayStation 3 video converter, 4Easysoft PS3 Video Converter converts your video into high quality movies playable on Sony PS3 (PlayStation3). It can both convert video to PS3 video formats as MP4, MPEG-4/AVC and extract audio from video to MP3, AAC, WMA with high quality. In addition, it supports the output files as definition 480p, 720p and 1080p. Well, you can feel the real HD video right now! 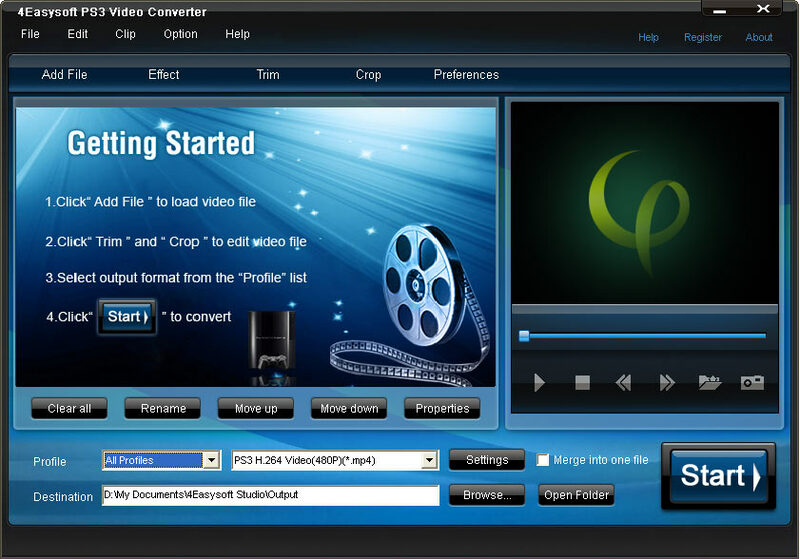 This Video to PS3 Converter provides you with various options to edit your video files, such as setting video effects, trimming file length, converting multiple files at a time, customizing video and audio output settings, preview movie before conversion and so on. Watch PlayStation 3 movies, TVs, home videos at once - a new lifestyle to experience with 4Easysoft PS3 Video Converter. Video:MPEG(mpg, mpeg, mpeg2, vob); Windows Media (wmv, asf); QuickTime(mov, qt); MPEG4(mp4, m4v); 3GP files(3gp,3gp2); Flash Video files (flv, swf); Real Video ( rm, rmvb); AVI, MKV, MOD, MPV, TS. HD video HD TS, HD MTS, HD M2TS, HD MPG, HD MPEG, HD MP4, HD WMV, QuickTime HD MOV, HD H.264, HD RM. Audio: WMA, WAV, MP3 (mp2, mp3), MPEG4 Audio (m4a), Real Audio (ra, ram), MIDI files (mid, midi), OGG, AAC, AU, AIF, AIFF, APE, FLAC, NUT. PSP MP4, AVI, WMV, MPG Video with high definition 480p, 720p and 1080p support, PSP HD H.264, HD DivX, H.264 HD, MPEG2-PS HD, MPEG2-TS HD, HD MPEG4, HD H.264/MPEG-4 AVC Video, MP3 - MPEG Layer-3 Audio, AAC, M4A. 4Easysoft PS3 Video Converter allows you to set the video Brightness, Contrast, Saturation. Checking Deinterlacing helps you to convert interlaced video to the progressive video, this function can optimize the video effect. PS3 Video Converter allows you to preview your movie anytime, even when the conversion is in process. You can take a snapshot for the movie screenshots you like. 4Easysoft PS3 Video Converter doubles your enjoyment with joining several interesting clips into one file after conversion. Crop frame size to remove your unwanted area using PlayStation 3 Video Converter like the smart scissors. With professional video encoding and decoding technique, 4Easysoft PS3 Video Converter brings you the advanced and high speed converting process. On the other hand, this video to PS3 converter has the magic charm to impress users with best video quality.